Looking for the Perfect Location for your Next Event? San Jose International & Monterey Airport. Venture Valley is designed to provide the optimum setting and inspiration for productive and successful meetings. We specialize in meetings and gatherings where one group or organization has exclusive use of the facilities. Venture Valley is an ideal setting for intimate group gatherings. 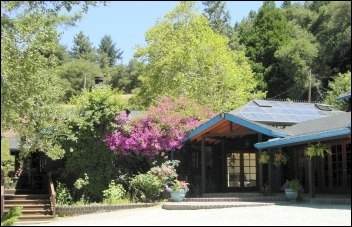 Organizations looking for a luxury California executive retreat will love our mountain location above Santa Cruz, near the greater San Francisco Bay Area. Our executive business retreat offers all-inclusive packages tailored for each group. 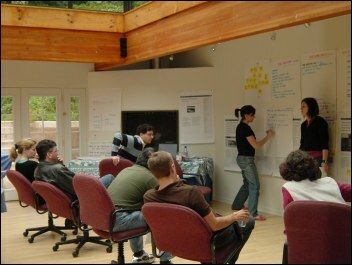 Our meeting rooms are unlike traditional conference rooms found at large Central California meeting facilities. 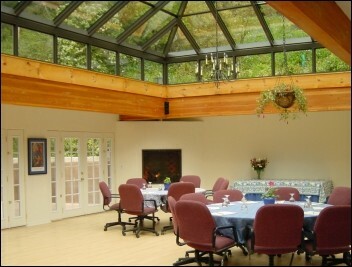 Each meeting room has lots of windows, great views, and even a fireplace. 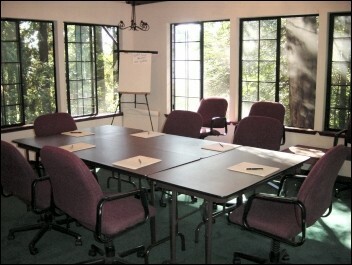 Our Monterey Bay meeting facilities can help groups focus on business matters, spiritual programs, and other pursuits. We also offer guests the chance to relax in the sauna, spa/hot tub or pool. We're just minutes from Monterey Bay. Corporate retreats at Venture Valley can be planned to include excursions to nearby towns. The staff are always ready to assist you at our Monterey Bay corporate meeting facility. We invite you to contact us for a customized quote for your next group meeting or to learn more about our services.